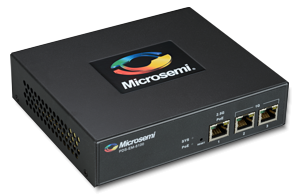 You are about to review presentations, reports and/or filings of Microsemi that contain time-sensitive information. The information contained therein is only accurate as of the date thereof. Such information is subject to change and Microsemi will not necessarily inform you of such changes. Microsemi will not be reviewing or updating the material that is contained in these items after the date thereof. The information contained therein may be updated, amended, supplemented or otherwise altered by subsequent presentations, reports and/or filings by Microsemi. All statements included or incorporated by reference in these presentations, reports and/or filings, other than statements or characterizations of historical fact, are forward-looking statements. These forward-looking statements are based on our current expectations, estimates and projections about our industry, management's beliefs and certain assumptions made by us. These statements are not guarantees of future results and are subject to risks, uncertainties and assumptions that are difficult to predict. Therefore, our actual results could differ materially and adversely from those expressed in any forward-looking statement as a result of various factors. Our Annual Report on Form 10-K, subsequent Quarterly Reports on Form 10-Q, recent Current Reports on Form 8-K, and other Securities and Exchange Commission filings discuss some of the important risk factors that could contribute to such differences or otherwise affect our business, results of operations and financial condition. You should review and consider risk factors when utilizing or relying on any information contained on this website. We undertake no obligation to revise or update publicly any forward-looking statement for any reason. If we use any non-GAAP financial measure (as defined by the SEC in Regulation G), you will find a presentation of the most directly comparable GAAP financial measure and a reconciliation of the differences between each non-GAAP financial measure used and the most directly comparable GAAP financial measure.